New Hampshire, with three projects planned, is the first state to take advantage of the Federal Highway Administration’s incentive program for State Transportation Innovation Councils. The state’s STIC won approval for $100,000 to fund its three proposals, which it narrowed down from five. The proposals will implement innovations to enhance efficiency in the design and construction of transportation projects that ultimately will save time and money. The STIC Incentive Program, launched in fall 2013, supports state efforts to deploy innovations. Under the program, each STIC can obtain up to $100,000 per year to to make innovative technologies or processes a standard practice in the state. "The STIC incentive funding came at the most opportune time,” said Brigitte Mandel, engineering and operations team leader for FHWA’s New Hampshire Division. “Reduced funding levels and challenging budgets have slowed the progress on these innovative initiatives, delaying the benefits that these innovations could achieve. This program is allowing wish-list initiatives to move forward much sooner than anticipated." One proposal will develop a state historic architectural and archeological resource database. The New Hampshire Department of Transportation will use the database as a tool to implement programmatic agreements on Section 106 of the National Historic Preservation Act to enhance early project planning and minimize impacts on historic and archeological resources. The agency expects the database to improve on the current process by creating a central repository for all project documents related to architectural and archeological resources. The database will make it easier to review project status by eliminating the time-consuming process of viewing multiple pages, as well as allow quick and efficient reporting of project findings. Another project involves buying computers and developing design standards to support use of three-dimensional engineered models in construction. The New Hampshire DOT will obtain computer-aided design workstations to create 3-D model plans and files that contractors can use to program equipment to do site work on projects. "The funding came at the most opportune time"
The project is part of a push to make 3-D modeling an everyday practice in New Hampshire. It’s expected to expedite project completion, increase productivity and reduce manual tasks associated with construction projects. The third project calls for buying ground-penetrating radar equipment and software to expedite project development and improve design practices. Ground-penetrating radar uses radio waves to collect data on pavement layer thickness and other properties, information traditionally obtained by drilling core samples out of pavement. The New Hampshire DOT plans to use the equipment and software to assess concrete bridge components, including validating concrete quality estimates on bridge deck rehabilitation projects and determining rebar depths on new construction. Using ground-penetrating radar is expected to save time while providing helpful information on projects. STICs—led by state and federal highway agency leaders in each state—bring together transportation stakeholders to identify and implement innovations, including those promoted through FHWA’s Every Day Counts initiative. New Hampshire’s STIC, formed in 2011, includes representatives from the New Hampshire DOT, FHWA, Local Technical Assistance Program, metropolitan planning organizations, American Council of Engineering Companies, Associated General Contractors, State Historic Preservation Office, National Association of County Engineers and more. Although the five proposals the New Hampshire STIC considered for incentive funding all came from state highway agency staff, “it was obvious they had coordinated with other STIC member agencies and had their support,” said Mandel. The projects that will be carried out will produce the added benefit of “improved communication and collaboration with our sister agencies and industry partners,” she said. At a time when tight budgets can make agencies reluctant to move beneficial initiatives forward, "the extra dedicated funding is what was needed to make these activities a priority," Mandel said. She encouraged other state STICS to take advantage of the incentive program and "look for the small opportunities that can make a big difference." For information on applying for a STIC incentive, contact the FHWA division office in your state. After arriving in the United States from Europe just a decade ago, warm-mix asphalt has become an award-winning innovation that’s helping states across the country improve asphalt compaction while cutting energy use and paving costs. Warm-mix asphalt is a NOVA Award winner. The National Asphalt Pavement Association and the Federal Highway Administration won the 2013 NOVA Award from the Construction Users Roundtable and the Construction Innovation Forum for their work to speed deployment of warm-mix asphalt technologies. Warm-mix asphalt includes a range a technologies used to reduce the production and placement temperature of asphalt pavement mixtures, resulting in construction, worker safety and environmental benefits. Since warm-mix asphalt was introduced in the United States in 2003, the country has become the world leader in adopting the innovation. It was part of the first round of Every Day Counts innovations that state highway departments focused on deploying between 2010 and 2012. FHWA Program Manager Matthew Corrigan joined NAPA Engineering Director Kent Hansen in accepting the NOVA award at the Construction Innovation Forum National Conference in Tucson, Ariz. Corrigan was recognized for his national leadership in advancing warm-mix asphalt technologies. Corrigan was FHWA’s lead for the investigation and implementation of warm-mix asphalt technologies in the United States and co-chaired the industrywide Warm-Mix Asphalt Technical Working Group. The group’s efforts resulted in the development of a warm-mix asphalt material and emission testing framework, an industry best-practices document and more than $7.5 million in research needs funded through the American Association of State Highway and Transportation Officials and the National Cooperative Highway Research Program. 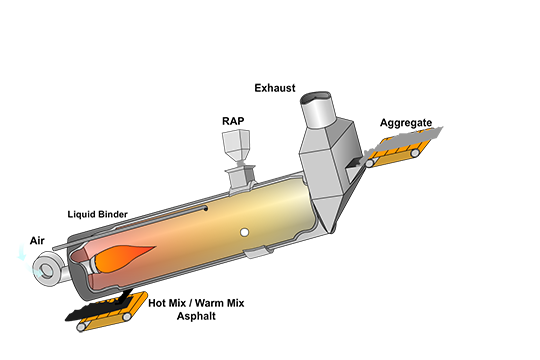 Animation of a mixture process for Warm-Mix Asphalt. A key factor in the successful spread of warm-mix asphalt technologies in the United States is the cooperation among transportation stakeholders, said Corrigan, including state highway agencies, asphalt pavement associations, contractors, academia, regulatory agencies and FHWA. “Everybody worked together to investigate and validate the technical aspects of the technologies and to make sure we had a consistent and clear message for the industry,” he said. It was FHWA’s investigation of early warm-mix asphalt technologies that laid the foundation for broad implementation through Every Day Counts, Corrigan said. An important resource was FHWA’s Mobile Asphalt Testing Trailer, which traveled the country to conduct tests and gather data on warm-mix asphalt demonstration projects. “Beginning in 2006, we used the trailer to collect information on the technologies and then brought data back to state highway agencies to ensure success,” he said. In choosing warm-mix asphalt to win the NOVA Award, the investigators cited its ability to improve compaction, reduce energy use, enhance worker comfort, lengthen the paving season and cut overall paving costs. Highway agencies are finding warm-mix asphalt to be particularly useful as a compaction aid to increase pavement density, Corrigan said. Increased density can result in longer pavement life and, ultimately, cost savings. 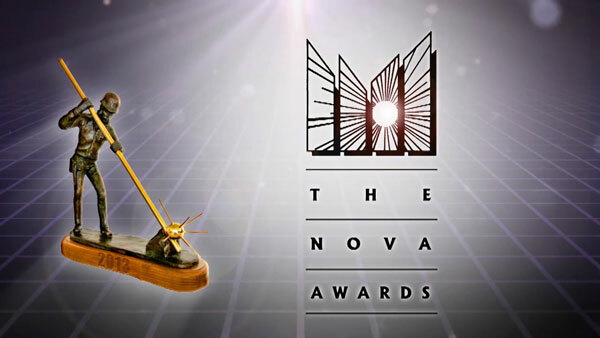 The NOVA Award recognizes innovations that have made significant contributions to the construction industry in improving quality and reducing costs. Since 1989, the Construction Users Roundtable and Construction Innovation Forum have presented more than 90 NOVA Awards to innovations involving 14 countries. Winners are selected by a jury of internationally recognized experts following a comprehensive investigation process. 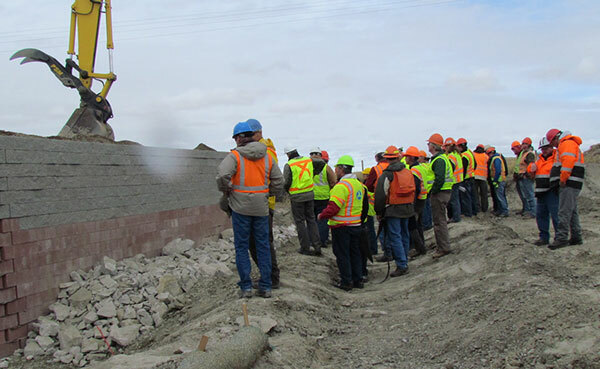 When the Montana Department of Transportation built its first geosynthetic reinforced soil integrated bridge system, it invited transportation professionals to the construction site to see for themselves how the technology works. The Montana DOT teamed up with the Montana Local Technical Assistance Program and Federal Highway Administration to present a showcase on the GRS-IBS technology used to build the new structure on U.S. 89 south of Dupuyer. GRS-IBS, an Every Day Counts innovation, is a form of accelerated bridge construction that lowers cost, slashes construction time, improves durability and increases safety. GRS–IBS technology uses alternating layers of compacted granular fill material and fabric sheets of geotextile reinforcement to provide support for the bridge. GRS-IBS also provides a smooth transition from the bridge onto the roadway. This type of bridge structure alleviates the “bump at the bridge” caused by uneven settlement between the bridge and connecting roadway. The Dupuyer showcase included a morning classroom session featuring an overview of GRS-IBS technology, design and construction criteria and lessons learned on the bridge project. In the afternoon, participants visited the bridge construction site to see GRS-IBS technology in action. Nearly 40 people from organizations in Montana and surrounding states turned out for the event, including representatives of state and county agencies, private industry and the U.S. Forest Service. A Montana DOT report on the project, Experimental Projects Construction Report: Geosynthetic Reinforced Soil Integrated Bridge System, is available. Adapted from article by Craig Abernathy of the Montana DOT in the winter 2014 LTAP Matters newsletter. Using innovative traffic management and the construction manager/general contractor process enabled the Michigan Department of Transportation to reopen all lanes of the Zilwaukee Bridge on I-75 three weeks early. The $70 million project includes reconstructing four miles of I-75 and replacing the bearing pads on the bridge to extend the structure’s service life and make the ride smoother for drivers. The agency accelerated the first section of the project, focusing on the southbound lanes, to avoid construction during winter weather. Work on the northbound lanes is scheduled for 2014. The Washington State Department of Transportation asked drivers to participate in a survey on the visibility of striping on I-90 over Snoqualmie Pass. This summer, the agency plans to install lane markings with solar-powered light-emitting diodes on the pass, hoping it will improve visibility and safety despite harsh winter weather conditions. The project—the state’s first to test solar-powered LED markers—is funded by an FHWA Highways for LIFE grant and the state gas tax. The Washington State DOT plans a fall survey to see if visibility improved. The Arizona Department of Transportation has formed an Arizona Local Public Agency Stakeholder Council, its first step in developing a formal partnering process with local agencies under the Every Day Counts effort on locally administered Federal-Aid projects. The council includes state, local and federal agency representatives from throughout Arizona. Its quarterly meetings will provide a venue for local agencies to discuss questions, concerns and suggestions on implementing Federal-Aid Highway Program projects. The Oklahoma Department of Transportation has successfully installed the state’s first high-friction surface treatment. The project involved one of the two most dangerous curves on State Highway 20 north of Salina. The second installation will be done when weather conditions permit. The long-lasting high-traction surface treatment was chosen to reduce crashes, injuries and fatalities. On hand to observe the installation were representatives from the Oklahoma DOT, FHWA, American Traffic Safety Services Association, local contractors, consultants and a contractor from Mexico. A November 2013 celebration in Augusta, Maine, marked the completion of interchange improvements at exit 113 of I-95. The $13 million project included two roundabouts at the interchange ramps, a new westbound connection to Route 27 and widening of the road to four lanes near a new regional hospital. The timeline was accelerated by more than a year to meet the hospital’s early opening. The project will minimize congestion, improve safety and provide easy access to the hospital. Three of the 12 winners of National Roadway Safety Awards used Every Day Counts innovations. The Connecticut Department of Transportation converted a rotary to a modern roundabout, which resulted in a 50 percent drop in the number of crashes at the site. Interstate Road Management Inc. installed high-friction surface treatments at 26 locations in a Kentucky project to lower fatalities on horizontal curves. And the Tennessee Department of Transportation improved safety at four intersections where a number of side-swipe crashes had occurred by implementing new J-turn designs. The biennial awards from the Roadway Safety Foundation and the Federal Highway Safety Administration recognize projects and programs that reduce fatalities and injuries on U.S. roads through excellence and innovation in operations, planning and design. Nearly three-fourths of travelers were very satisfied or satisfied with a temporary smart work zone traffic system used during construction of a new interchange on I-35 in Johnson County, Kansas, according to results of a user satisfaction survey. The system used real-time traffic data to advise travelers about traffic conditions on the interstate. The Kansas Department of Transportation received a Highways for LIFE grant from the Federal Highway Administration to support use of the intelligent transportation system and document its benefits for possible use on future projects. It was the state’s first major smart work zone project. The Kansas DOT and its contractor, Clarkson Construction of Kansas City, Mo., built the $21 million diverging diamond interchange to handle traffic demand created by economic development in the region. Previously, there was no access to the interstate at the intersection with Homestead Lane, a two-lane road over I-35. The agency set up an array of equipment to run the smart work zone, including 16 variable message boards, 21 queue trailers, six video trailers and eight trailer-mounted variable speed limit signs with supporting software and a website. Originally, the agency had hoped to use the smart work zone for the full two-year duration of the project, but for project phasing reasons, the ITS equipment operated for two months near the end of construction. The signs were placed upstream of alternate routes. The signs did not suggest alternate routes, but did notify motorists of travel times through the work zone. That way, local travelers who knew alternate routes could take them if travel times exceeded their limit. The new interchange is Kansas’ first diverging diamond interchange. A DDI is one of the innovative interchange geometrics included in the FHWA Every Day Counts initiative. “We chose the diverging diamond interchange as a solution for the volume and type of traffic we are managing at that location, both now and for the future,” said Steve King, Kansas DOT road design leader. A nearby intermodal facility generates considerable truck traffic at the interchange, and more support facilities for the intermodal center will be developed over time, bringing more truck traffic, King said. A DDI is a safer, less expensive interchange than other types because it avoids conflicts between oncoming vehicles and left-turning traffic. As the Federal Highway Administration encourages highway agencies to try intelligent compaction through its Every Day Counts initiative, many states are adopting some form of the technology into their road-building specifications. More than 18 states have developed or are developing intelligent compaction specifications for their regular practices, reports Antonio Nieves Torres, FHWA construction engineer. “Intelligent compaction induces a paradigm shift in construction to improve workmanship, which is identified as the number-one factor for premature pavement failures,” said Torres. Whereas conventional compaction tests for asphalt, soils and road base materials rely on spot-testing methods, intelligent compaction can provide data coverage over the entire roadway. Deploying new compaction rollers with intelligent compaction capabilities can potentially result in increased uniformity in material density. It’s possible that intelligent compaction can improve operational efficiency by reducing the number of passes needed to obtain specified density. The main benefit of intelligent compaction is to provide data that lead to optimum compaction—not too much or too little. Taxpayers will benefit when contractors can provide optimum compaction with only the effort required. And the traveling public will get longer-lasting pavements. A road base compactor with an intelligent compaction system on board provides data that can lead to optimum compaction. To be sure, more and more states are jumping on the intelligent compaction bandwagon. In 2013, there were intelligent compaction field demonstrations in Ohio, Maine and California. Intelligent compaction open house events took place in those three states plus Tennessee. Maryland, North Carolina, Kentucky, Washington and Idaho plan intelligent compaction field projects this year. “Most states are not modifying their current testing schedules, but are using intelligent compaction as a quality control tool only,” said Rebecca Embacher, advanced materials and technology engineer with the Minnesota Department of Transportation. The Minnesota DOT has used intelligent compaction on about 33 projects, six of which had the entire rolling train instrumented with the technology. The agency plans to implement intelligent compaction on the entire rolling train for nine projects during the 2014 construction season. The Minnesota DOT is the state steward of the intelligent compaction specification proposed as a provisional American Association of State Highway and Transportation Officials specification. FHWA also has developed a boilerplate specification for intelligent compaction. “Core densities or nuclear density tests provide excellent material property information for the in-place material. However, these measurements are taken in only select locations and, consequently, may not always adequately represent properties of the given pavement section,” said Embacher. Intelligent compaction rollers can’t measure the density of asphalt or other road-building materials. Instead, they measure the relative stiffness of a material. An FHWA research project is underway to correlate stiffness to density. To help highway agencies get started with intelligent compaction, Torres said, FHWA has formed the Intelligent Compaction Technical Support Service Center to provide information and telephone and email support. The center provides intelligent compaction guidance specifications (including FHWA’s boilerplate), reviews specification development and pilot project selections, and offers training for agency and contractor personnel.